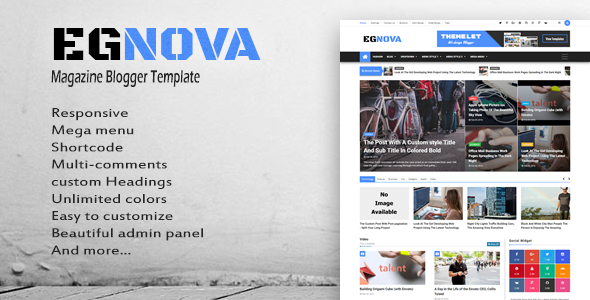 Description: Egnova - News & Magazine Responsive Blogger Templates is a beautifully designed responsive magazine blogger template. It comes with many features such as Awesome admin panel, Clean layout, Side panel, Multiple style of recent widgets and more. It can be used for news and magazine type blogs. It Can be fully customizable in blogger theme designer such as backgrounds and colors etc.